Join the Mega Scavenger Hunt During BOS with Bushwick Daily & Slideluck! It is true, everybody! 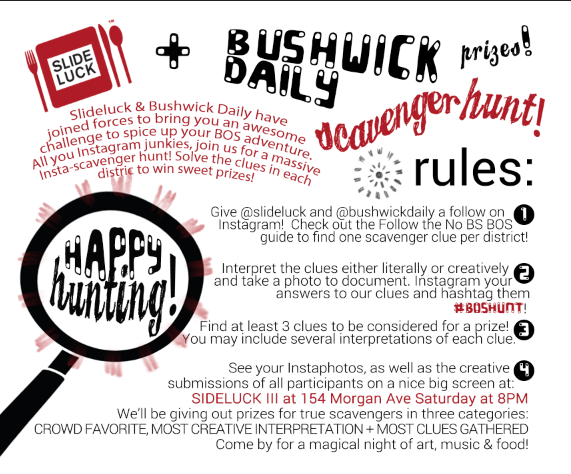 Bushwick Daily has partnered with Slideluck, a local awesome non-profit organization to bring you a fabulous Instagram scavenger hunt (check out the rules above)! Because we know how much you all love Instagram (and so do we) we created this fun gave to play while strolling our fantastic neighborhood during the Bushwick Open Studios festival. Pick up a copy of No BS BOS guide for clues and start hashtagging your answers #BOShunt! The entire game will culminate into the Saturday night event, Slideluck Bushwick III. at Sandbox Studios Bushwick at 154 Morgan Ave at 7PM. Your Instagram answers will be projected onto a huge screen and prizes will be awarded to the best of you. What else will go down? Besides rewards to the best scavenger hunters, some traditional Slideluck awesomeness -- this time featuring 10 artists from Bushwick and 10 artists from Baltimore in an amazing, atmospheric slideshow. Each contributor will be paired with music from local musicians. The Baltimore portion was curated by Doreen Bolger, Director of the Baltimore Museum of Art. The Bushwick selections were made by Alanna Heiss - Founder of PS1, Clocktower Gallery, and Art International Radio - and her team at Clocktower. Bring a dish, a friend, an appetite for art, and soak in some sweet Bushwick action with us on Saturday!